The new SRAM eTap AXS drivetrain features smaller chainrings, a wider cassette range, a novel hydraulic rear derailleur clutch, and much more. 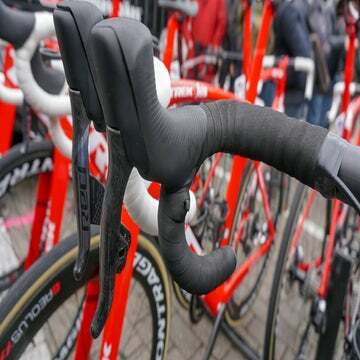 SRAM’s first eTap group was notable for what wasn’t included — specifically, shift cables. While the brand-new eTap AXS remains wireless, the big story is how it reimagines gearing on drop-bar bicycles. For starters, SRAM has joined the 12-speed parade. But that’s just keeping up with the Joneses (or Campagnolos). SRAM blows right past them with an entirely new approach to gear ratios. Your easiest gear is easier, your hardest gear is harder, and the jumps in between are smoother. To achieve the seemingly contradictory combination of wide range and tight jumps between gears, SRAM’s 12-speed cassette starts with a 10-tooth cog and makes successive 1-tooth jumps up until the 17-tooth cog on the 10-26T tooth cassette. There are also one-tooth jumps in the same configuration on the 10-28T cassette, and one-tooth jumps up until the 15-tooth cog on the 10-33T cassette. And the chainrings have shrunk. The available combinations are 50/37T, 48/35T, and 46/33T. The 50/37T option will likely find a home on pro bikes and with competitive racers. The vast majority of riders will find the 48/35T rings most appropriate; novices, or those living in the mountains, can err toward 46/33T. If those chainring sizes seem unfamiliar to you, that’s the point. SRAM has essentially shifted much of the gear range to the cassette. That leaves a 13-tooth jump between your large chainring and the small one. This decreases the severity of a front shift. It also means you’re less likely to find yourself searching for the right gear, only to find it only exists hypothetically between gears. Now that gear actually exists, and when you initiate a front shift, your cadence will not change as drastically. You get the option of a power meter crankset as well. The Quarq power meter integrates into the chainring on both 1X and 2X systems. It’s lightweight and is less expensive than previous Quarq power meters. Fortunately, SRAM offers the eTap AXS Power Meter Support program. When you do wear out your rings or need to replace the power meter, you can send it back to SRAM for recycling and get a new one at half price. That redesigned cassette mounts to SRAM’s XDR driver. If you’ve got a mountain bike with a SRAM cassette on it, the XDR should look familiar. That’s because it’s essentially identical to the XD driver, except for some spacing considerations. Both the XD and XDR drivers accommodate cassette cogs with fewer than 11 teeth. Don’t worry, though: You won’t need a new wheel, or a new frame, just to use XDR. The only difference is the XDR driver compensates for the extra cog in the road cassette. (An Eagle cassette’s largest cog is so large that it can clear the spokes. Smaller road cassettes cannot.) It’s even compatible with Eagle cassettes, though you’ll need a spacer to do so. As was the case with the original eTap, the rear derailleur remains the brains of the whole operation. But it too gets an overhaul with SRAM’s Orbit chain management system. The centerpiece is the ultra-lightweight and speed-sensitive fluid damper, called the Orbit, which lives inside the rear derailleur’s B-knuckle. Every other derailleur on the market relies on a combination of spring tension and friction to offer a “clutch” feature. SRAM’s approach is unlike any we have seen before. Gravel riders and cyclocross racers will be excited to have a new clutch derailleur option that will work with either single- or double-chainring drivetrains. Up until this point, only Shimano’s clutch-equipped mountain bike derailleurs and the Ultegra RX derailleur worked with drop-bar double-chainring drivetrains. This non-serviceable damper helps reduce derailleur movement over chatter, and it increases chain tension throughout the drivetrain — but only when it’s needed. It won’t activate during shifts or other slow movements like pulling the derailleur back to change a wheel. It only activates when the bike encounters large, fast motions. Think of it like a tennis racket: If you swing it slowly, you’ll encounter only a little bit of resistance. Swing it fast and you’ll feel much more resistance. The Orbit system works the same way, except instead of moving through the air, the Orbit’s “racket” moves through fluid. Both 1X and 2X drivetrains use the same rear derailleur and accommodate up to a 33-tooth cassette cog. The front derailleur has been moved slightly outboard to accommodate larger tires. The Flattop chain is perhaps the most glaring visual cue of the entire system. SRAM essentially filled in the gap on the top of each plate to increase the chain’s strength. The chain is also narrower to accommodate the 12-speed ecosystem. SRAM says the chain makes the drivetrain quieter overall. You can mix and match eTap road products with Eagle products. As a rule of thumb, however, it’s important to remember that the rear derailleur will dictate which chain and cassette you use. For example, if you’re using a road rear derailleur, you must use the Flattop chain. But you cannot use a Flattop chain with an Eagle rear derailleur. If you want to run a 1X system with a lower gear range on your road or gravel bike, you’d need to use an Eagle AXS cassette and chain, but you can use an Eagle or eTap AXS crank or eTap AXS shifters. The eTap AXS shifters are compatible with Eagle AXS components, and you can even control the wireless dropper post using your eTap AXS shifters or blips. And perhaps most importantly, eTap AXS will trickle down to the Force group level sometime in April. That opens up SRAM’s wireless systems to a much broader audience. A quick note about friction: since SRAM’s cassette uses a small 10-tooth cog, and the chainrings have also gotten smaller, it stands to reason that the drivetrain will create more friction overall, costing you watts. But there are mitigating factors here, notably the rear derailleur’s clutch mechanism that could, in theory, reduce tension in the system. And chainline matters as well. We don’t have concrete numbers on the drivetrain’s friction until we send it to the lab for testing, but it’s safe to say a 10-tooth cog will cause more friction. The important questions are whether that matters to you more than exceptional usability and whether other factors can help reduce that friction overall. Like most things in our modern lives, eTap comes with an app. The AXS app allows you to customize your shift layout and turn on enhanced shifting features like sequential shifting and compensating shifting. The former automatically actuates the front derailleur based on your position on the cassette in order to keep your cadence consistent. The latter compensates in the rear when you activate a front shift. SRAM made a point to mention that you do not need to create an account to use the app. If you want to do things like track your various bikes and get maintenance notices — when it’s time to change your chain, for example — you create an account. But you can also simply take the components out of the box, install them on your bike, and pedal away. The roadies don’t get all the fun stuff. Mountain bike components also fall under the AXS umbrella, which means you can go wireless on dirt, too. Eagle AXS includes a new rear derailleur, shifters, and dropper post. The shifters ditch levers and opt instead for buttons that are super easy to push. Like eTap AXS, you’re able to configure your shift layout in the AXS app, but this isn’t required. You can simply install the components and start riding if you choose. Cassettes have not changed, other than some new color options. The wireless dropper post is perhaps the niftiest integration on the mountain bike side. Like all the other AXS components, the dropper runs off an eTap-style battery that mounts at the head of the post, just under your saddle. Actuation is quick and smooth. It’s also nice to have an extra battery on the bike, just in case your derailleur battery runs down mid-ride. You can assign which button on the shifter you want to use to actuate the dropper. If you’ve never ridden the roads in and around Tucson, really all you need to know is that they aren’t smooth. The heat buckles the tarmac, creating seams and peaks that rattle bike and rider. This was a great place to test SRAM’s new Orbit mechanism, among the many other new features of eTap AXS. But before those rough roads came into play, it became immediately clear that eTap AXS shifts a lot faster, and a lot smoother, than its predecessor. The one-tooth jumps on the rear cassette meant I was rarely, if ever, searching for the right gear. It was always available. Each transition from one gear to the next felt buttery smooth. I’m not ready to say SRAM’s new gear ratios are heads and tails better than what we’re used to, but my first impression with the drivetrain left me very impressed. Front derailleur shifting has improved significantly. That’s a function of the smaller chainrings, as well as a smaller 13-tooth jump between rings. SRAM representatives mentioned repeatedly that we testers would find ourselves staying in the big ring longer and making fewer front shifts. That played out on the road. Less time thinking about shifting left more time for enjoying the ride. About that Orbit Chain Management System: While it’s difficult to gauge whether this system works any better than another clutch derailleur simply by riding it over bumps, it’s also fair to say that the drivetrain certainly sounded noticeably quiet. The chain didn’t slap around or hit the chainstay, and I didn’t feel any jostling from derailleurs or chains flopping around. That’s a good indication that the Orbit system works as intended. It’s fair to argue that SRAM missed an opportunity to slim down the HRD brake hoods. 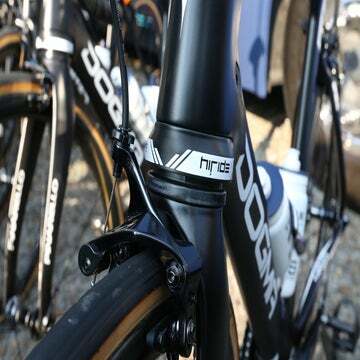 They’re very tall and wide when compared to Shimano’s Dura-Ace hoods, which makes them feel too bulky at first. But day two of riding found us on gravel bikes, and the larger hood surface actually ends up being an advantage over washboard at high speeds. And to be fair, the hood ergonomics feel just fine. They’re comfortable, they’re just not the small, sleek hoods you might be used to if you’re switching over from a Shimano system. What I love most about SRAM’s eTap AXS is something you can’t see or feel at all. It’s the fact that the company appears to have listened to its customers. Faster shifts? Okay, we’ll get that dialed. Smoother transitions between gears? Got it. You don’t want a new, proprietary freehub that will require a new wheel? We can (and did) do that. ETap was good. ETap AXS is a major leap forward. We’ll know a bit more about durability after we get some more miles on it, so keep an eye out for a long-term review in a few months. SRAM covered travel and accommodations for this product launch.